> 8-9-2018 - node has been active for a couple of days now, no breakdowns etc. I consider this one final, if there are suggestions/questions, please let me know. 26-8-2018; So far it worked! fixed my mistake with the LDO by soldering a wire to connect the enable pin. I'll upload corrected Geber files soon. Added sketches, they work but don't know that the sleep current is atm. 29-8-2018; Uploaded sketch, since my multimeter only does mA, I can confirm it sleeps at around 00.01 mA, when woken up, it rises to 17 mA. 29-8-2018; Hmz, upload of the sketch went wrong... uploaded again. 5-9-2018; Drilled the holes and assembled the endproduct, Uploaded last sketch and last updated Gerber files. 8-9-2018; Tilted the PIR to have a wider field of sight. => also tested the range with this gateway. I got about 15 meters, including 3 single brick walls and an outer brick wall (2 layers incl insulation). So I'm pretty content with the range. When this would be too little, I can fall back to a couple of repeater-nodes. Battery-Powered NRF52-Node, with PIR + RH/T for building into a wall socket. I started with the Idea of building a wall mounted socked in every room in my house, one I could place next to every light switch or electrical outlet. I made some progress over the months, where I first made an inwall node that was made to be built with a local store outlet-front LINK to gamma.nl => PCB that fitted into that outlet. Since the new house is built with JUNG outlets I redesigned the PCB so it fits with the JUNG AS500 outlet series. So, the introduction is over, let's talk about the design. It is a node powered by 3 AAA Batteries, but if needed can be fed from another 3 up to 5V input. 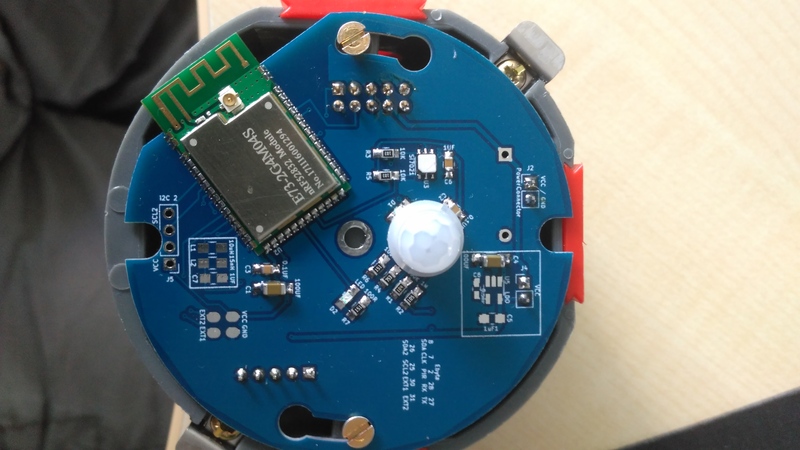 The PCB is made to replace the steel bracket so it fits right in as a replacement and you only need to drill a small hole for the PIR-cap and the temperature sensor. The Temperature-sensor is a SI7021. Untested: I was scouring the forum and found that there might be an implementation of an ATaes132a, so I took the liberty to place it in there, even though I might not even use it. Also, hope it is connected well.